Many cultures have a strong connection to cooking with fire. Americans think that what they do – slow roasting on a fire – is real barbecue. Canadians think that quick hot cooking on a grill is barbecue. Argentines cook huge hunks of meat on open coals and call it asado…that is South American barbecue. Australians too are famous for barbie. And while the common stereotype in Canada is that Aussies cook shrimp on the barbie, it looks more like sausages are the local barbecue specialty in the Riverina. 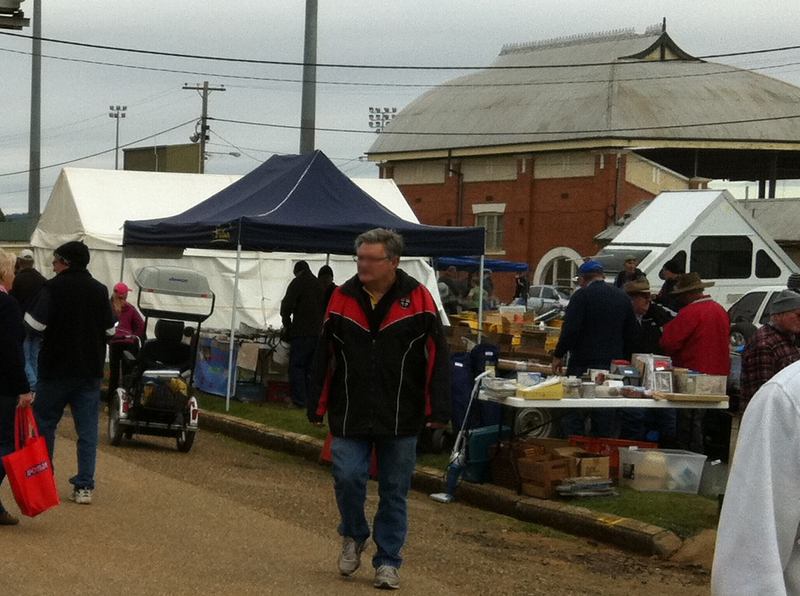 On our second weekend here, we went to the Wagga Swap Meet. It was a real introduction into bogan culture...a huge flea market type of thing with lots of car parts available. There were a lot of community groups selling sausage sangas. You can buy a variety of sausages in Wagga, but the most common type are long and thin, kind of like a Canadian breakfast sausage in diameter but maybe 12 inches long. We have cooked both lamb and chicken versions, so aren’t sure what the real traditional one might be. Maybe beef or pork is more common. But it seems that the traditional way of eating them is grilled, and then wrapped in a slice of white bread. This is what is called a sausage sanga (you’d think they would have come up with a more creative name, like sausie sanga). We haven’t tried one yet, but they are available wherever soccer teams and service clubs need to raise money, such as in front of Bunnings hardware on Sunday afternoons. 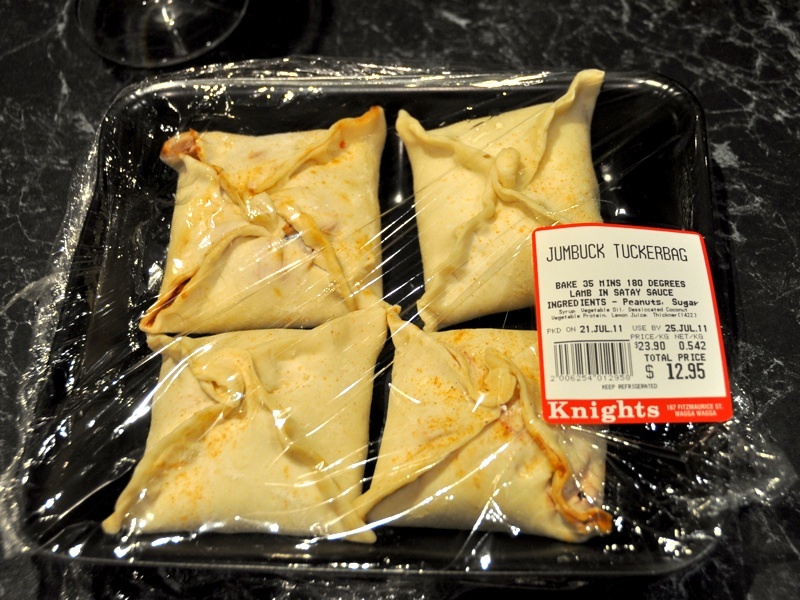 Despite the silly name (which has something to do with the song Waltzing Matilda), these little lamb parcels from Knights were tasty! We bought a barbecue and have been doing a lot of cooking on it, while we wait for our pots and pans to arrive. We bought a couple of cheap pots for cooking inside, but use those as little as possible. We’ve cooked rice a couple of times, some peas, heated some store-bought soups (good stuff from a NZ company called Pitango). And we used the oven once to heat some lamb parcels we bought at Knights Meats. Otherwise, all barbie all the time. Dan is a genius with the barbecue. (Note: yes, I’m (Dan) writing this bit…but Lisa won’t be taking it out! Note from Lisa: gotta let him believe he’s a genius at something!) Already, he has cooked lamb, pork, chicken, beef, duck, and kangaroo. That’s all pretty typical though; it is just meat. But there’s also been veggies: pumpkin, kumara (sweet potato for all you Canadians), potatoes, capsicum (the Aussie and European name for what Canadians call bell peppers), fennel, bok choy, oyster mushrooms…he’s been pretty creative. This thin sheet of teflon is the key to cooking on a barbecue. The salesperson even suggested that they are great for travel. There are public gas barbecues in parks all over the place, but they might be a bit, shall we say, scuzzy. 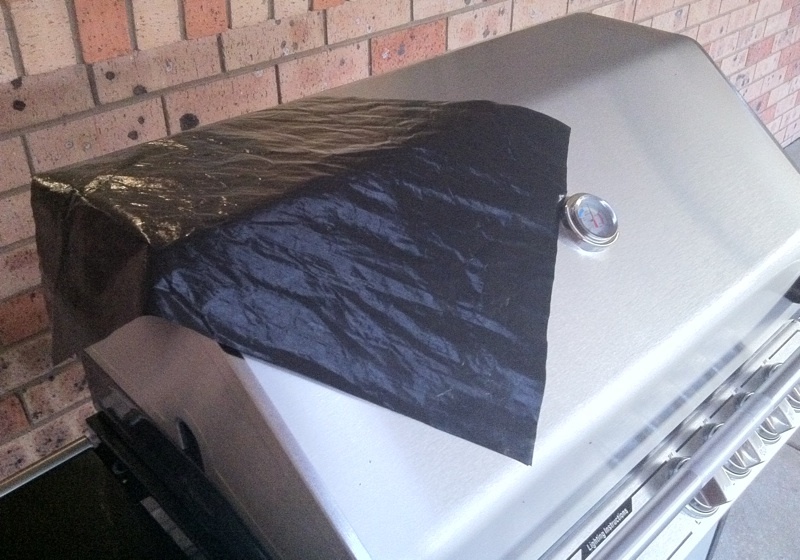 Just drop your own teflon sheet liner on the grill and cook away! An odd thing about Australian barbecues (the machines, not the events) is that they all come outfitted with half grill, half griddle plate. We were used to all grills; we had bought a small griddle for our barbecue in Canada, but only used it once or twice. But it seems here, cooking on a flat-top is as common as it is on the grills. The woman serving us at Barbecues Galore said that her husband prefers all his food cooked on that side; she prefers grilled. At first, we were thinking about swapping the griddle out for more grills, but then thought, when in Oz, cook like an Aussie. And it seems that the best way to do that is with a thin teflon sheet. The sales lady showed us this thing, and it is amazing. You lay it on the griddle half of the barbie (don’t put it over open flame) and it 1) keeps the griddle clean, 2) prevents sticking, allowing you to cook damn near anything, and 3) probably causes cancer. So that is how the bok choy, the oyster mushrooms, etc., got done. The first time he used it, Dan put some oil on it…big mistake, as the fennel was sliding around so much he could barely get it off the griddle! Three vegetables we have been eating a lot are pumpkin (butternut so far, will experiment with the other, bigger ones eventually), kumara, and fennel. These are all things we could get in Edmonton but didn’t eat often. Not sure why on the first two – they are great! Fennel we love, but it was very expensive in Edmonton. Here, a huge bulb that will do us for 2 meals is about $1.50 – $2 depending on where you shop; that same amount in Edmonton would have been in the $8-10 range. The kumara and pumpkin we’ve been roasting; kumara in foil, pumpkin just on the top rack of the barbecue. Not sure why the difference in method…maybe we’ll switch it up soon. We’ve found some good spice mixes by a company called Herbies, and found that the Persian mix is good on kumara. There have been some pretty amazing meals done on the barbecue. Steak, potatoes, and pumpkin was an early one; not long after that were lamb chops marinated in yoghurt infused with cardamon, fennel seed and coriander, served on a rice pilaf with cashews and peas and the Persian spice mix (the rice was done on the stove). But the real winner was also the most experimental: duck breast with a spiced orange sauce (bought), served on a bed of bok choy, with oyster mushrooms and sugar snap peas (peas done on stove). It was a challenge, but absolutely fantastic. The next big experiment, however, was pizza. This is the ultimate Aussie pizza. Kangaroo mince and kumara, with beet and macadamia pesto for a sauce and a local(ish) goat cheese. Crust came from The Artisan Baker (great French baker in town! ), and it was all done on the barbie, then topped with rocket (arugula for all the Canadians). The picture on the right, if you haven’t figured it out, is a few steps along the way: browning the kangaroo and roasting the kumara, starting to cook the crust, with the toppings on the barbie, and then finished with rocket and being cut to serve. How was it? A good experiment, but not one of our best meals. It will, however, get perfected. This entry was posted in Australia, bogans, cooking, cultural differences, food, language, Riverina, sausage, small town culture, wagga. Bookmark the permalink. The teflon sheet is a good way to keep your barbecue clean, but I’ve never seen it done in practice. At every barbie I’ve ever been to or hosted: you scrape off as much crud from the cooking as you can be bothered, leave it, then then next time you use it you heat the barbie, pour some of your beer on the griddle, and scrape some more until it’s clean enough to cook on. Even if you don’t drink beer! I actually like leaving the crud on the barbecue – it adds flavour! Seems like a waste of beer. Of course, I haven’t found any really good beer here yet, so pouring some on the griddle wouldn’t really be wasting it I guess. No one in my house drinks beer at all, and yet it always seems to be the done thing on the bbq 🙂 And yes, the crud adds flavour! Did I teach you nothing?! Make your own crust. I’m looking forward to visiting once you’ve perfected some of these dishes. I’m sure it’ll only take a few weeks at most. Hard to make our own crust when we don’t even have a bowl to mix the dough in. When we get our stuff, then we will ask you for the dough recipe again.